Finally working on Trolls again! 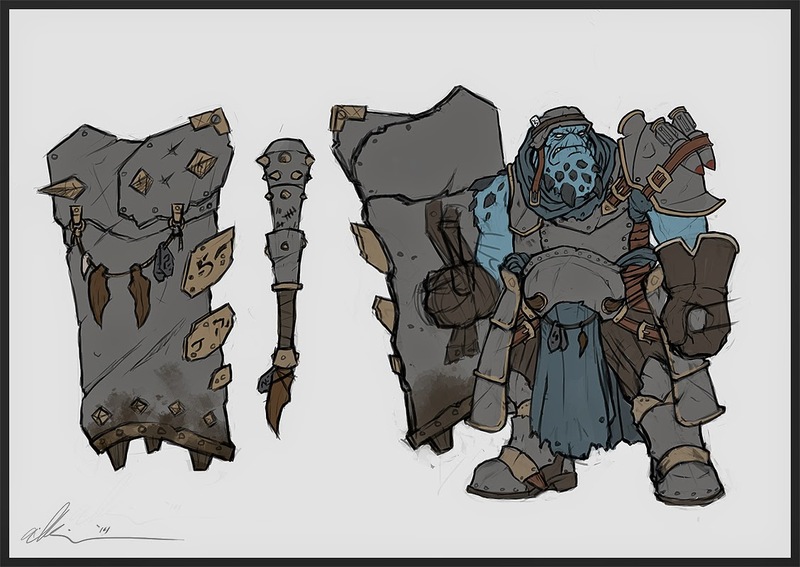 A little while back I did a concept for an IKRPG character that was a stylized Trollkin Warder. 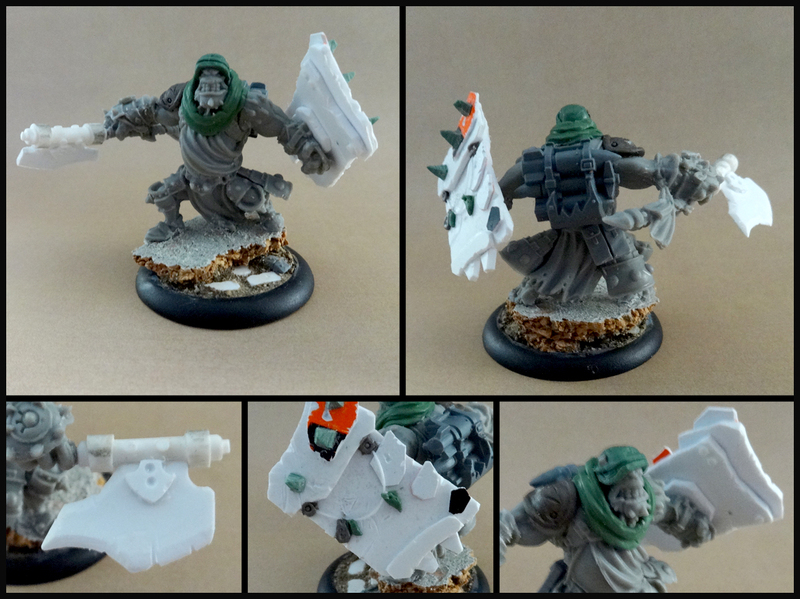 It served a dual purpose though, as it shared the same aesthetic my Trollbloods have; a trench warfare salvaged look. I finally picked up a box of Warders (after much deliberation between Scattergunners. Scattergunner offer less in the way of conversion, which is part of the hobby I love). After lamenting over mold lines, I got to work with the green stuff, giving them the helms and keffiyeh-like military scarves. One thing that I wanted to set them apart with was their sheilds. In the concept, they had slapped together metal slabs that gave them a riot shield like look. 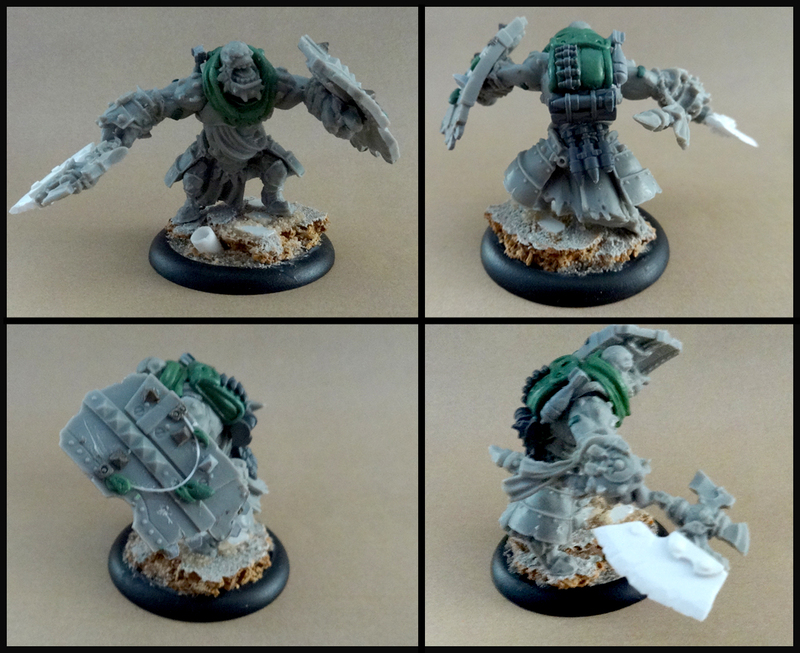 I definitely wanted to do one like the concept out of plasticard, but I also had a Khador Devastator sheild laying around along with a Rover shield, which were perfect looks. 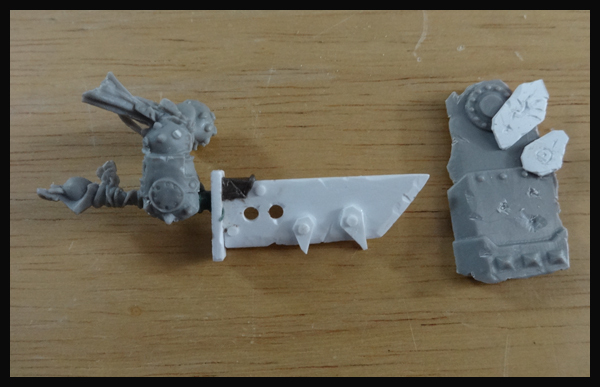 I also did some new weapons out of plasticard, as I couldn't stand the axes. They were just too curvy and odd, so I opted for more hard edged, brutish looking weapons. The cord on the sheilds was actually taken from the thin long part of clothing tags. Yeh, you know that sword. Since I had already used some 40k Ork bitz on my Bomber and Impaler, I might as well utilize the bitz I have if they fit. Having anything too identifiable would be bad, so I stuck to bullets, rockets and ammo pouches (though the rocket pack was too cool to not use.) Veteran players can probably identify what bitz are from what, but I don't think most people care. I wanted to give them the look that they are picking up anything usable they can get their hands on and bring it back to the group. Trying to get all my trolls painted by the 16th for a tourney, so hopefully you all should see some more updates on here soon, including my new Dozer and Smigg!